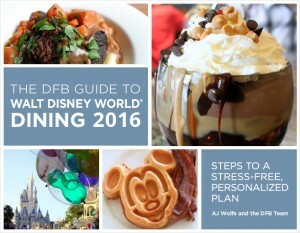 The DFB Guide to Walt Disney World Dining 2016 also features a chapter on what’s new in 2016, tips for dining at Be Our Guest and other popular restaurants, and a list of must-do restaurants for first-timers. The e-book is an instantly downloadable PDF which makes for easy reading on your smartphone or tablet at the parks or at home. And like all the DFB Guides, the DFB Guide to Walt Disney World Dining 2016 also comes with a money-back guarantee. To celebrate the grand launch of the DFB Guide to Walt Disney World Dining 2016, the DFB has a special deal – use the code HappyPlace and you’ll receive $4 off the cover price of $18.95.